I was housed at Château Haut-Bacalan, a property in the Pessac-Leognan region (also home to Château Pape Clément and Domaine de Chevalier), and was fortunate to experience Bordeaux from the confines of a working winery. In the mornings the smell of freshly mauled grapes filled the air, setting the sensory tone for my day ahead. Some were spent speaking broken French to the workers next to the sorting table, some visiting the various appellations, while some were spent experiencing the art de vivre of a city older than I have ever experienced. 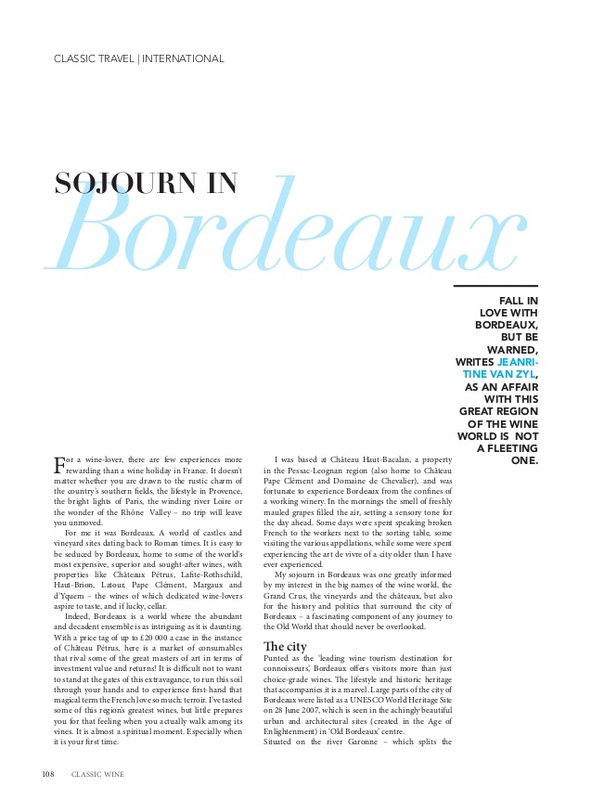 My sojourn in Bordeaux was one greatly informed by my interest in the big names of the wine world, the Grand Crus, the vineyards and the châteaux but also for the history and politics which surrounds the city of Bordeaux – a fascinated component of any journey to the Old World that should never be overlooked. Punted as the “leading wine tourism destination for connoisseurs”, Bordeaux offers visitors more than just choice-grade wines. The lifestyle and historic heritage which accompanies it is a marvel. Large parts of the city of Bordeaux were listed as a UNESCO World Heritage site on 28 June 2007, which is seen in the achingly beautiful urban and architectural sites (created in the Age of Enlightenment) in ‘Old Bordeaux’ centre. Situated on the river Garonne – which splits the region into ‘left bank’ and ‘right bank’ appellations – the historical importance of the city’s port, but also as a life force today is very evident. The hustle along its banks is largely due to the abundant modern wine bars and small cafés which are situated along the streets leading from the famous Place de la Bourse, and is a beautiful place to enjoy a carafe (or bottle) of something memorable. I was inadvertently drawn to the Saint Michel basilica, built in the 15th century with a bell tower called Le Fleche, the tallest building in Southwest France, in which silent shadow a bric-a-brac market stirred a bargaining crowd. With wines found in its 60 appellations, the combination of wine, art and architecture fills an important tourism offering here. You can follow any pebbled street and be sure to eventually find a wine bar, but perhaps most rewarding is the Rue Notre Dame, which houses many antique dealers and which leads to Musée du Vin du Négoce, a fascinating museum focusing on wine and wine trade. All this said, a visit to Bordeaux naturally has the objective of visiting the region’s famous winelands. Be warned however, as I discovered, Bordeaux is not a small village surrounded by vineyards, which makes traversing the winelands of Bordeaux a less-than-straightforward affair. Although the Bordeaux and Bordeaux Superieur, Médoc and Pessac-Léognan appellations border the city, the closest vines are still 20 or 30 minutes by car or bus from the city centre. Something to keep in mind when travelling here – as car rental might be your best option, or else, as I did, opt to discover Bordeaux the real touristy way (which is what you are after all) by hopping on a bus that travels to a respective Bordeaux appellation on a daily basis. The tours provided by Bordeaux Tourism, apart from being the most convenient option, also gave me a snapshot of the region in a matter of days. Wanting to visit ‘famous’ vineyard sites like those found in the Médoc or St-Émilion, it is easy to overlook smaller properties, especially those in more outlying vineyard areas. Of course, it depends what one is after. If you are looking for unassuming, but highly drinkable and well-priced wines straight from the cellar, head to Entre-Deux-Mers. It literally means ‘between two seas’ and so named because of its location between the Dordogne and Garonne rivers, if not for the wines, it is worth a visit purely for its impressive rural landscape, which is dotted with forts and castles – distant memories of a rich history. On the serious side of the spectrum is St- Émilion, an appellation which was declared a World Heritage Site by UNESCO in 1999 and home to Merlot, glorious and awe-inspiring Merlot. Aspirational drinking? This appellation, together with adjacent Pomerol, has got you covered. Chateaux Magdeleine, Angélus, Figeac, la Gaffelière, Vieux Château Certan…and that’s just mentioning the big names. Here caves, dug into the limestone rock, serve as cellars, safeguarding wines that can age for years, even decades. Built from this limestone is the town – and proclaimed ancient monument – St. Émilion. Wander its cobbled, narrow and (perilously) steep streets, be seduced by the myriad of wine shops offering the buyer some of the world’s great wines and allow plenty of time to embrace its history. Founded by monks and supported by pilgrims, the town today draws a boisterous crowd for more than just its history, but before settling down with a créme de cassis a visit the 12th century Monolithic Church is highly recommended – it reminds of a time when architecture served more than just a functional objective. Bordeaux is predominantly Cabernet Sauvignon and Merlot country, with Cabernet Franc, Petit Verdot, Malbec, and small percentages of Carmenère making up the balance with Semillon and Sauvignon Blanc on the white wine front. During my time of visit, in middle September, cellars were busy harvesting Merlot, after an early vintage that saw white varieties harvested some two weeks earlier than normal. Charles-Henri Gonet, owner and winemaker at a couple of Bordeaux properties, including Haut-Bacalan, was quite adamant that although the 2011 vintage was one with great challenges – hail in some quarters mid-way through vintage which destroyed many crops and less disparity between night and day temperatures for example – there was no need for consumers to fear less than great wines. “Perhaps less upfront fruit flavours, but lots of tannin and acid structure,” was his early observations during a barrel tasting of his 2011 Merlot. Ultimately, only time will tell whether 2011 will again, like 2010, be declared (another) vintage of the decade. And for that call wine lovers would have to wait until the much anticipated annual en primeur tasting next year. One factor that did stood out was the importance the growers lend the Chinese market. Chinese charms decorate cellars with certain winemakers also admitting that this market is definitely exerting an influence on wine styles produced here. “Less tannin, more fruit and easier, smoother drinking,” was how one Bourg grower described this ‘favourable’ style. Which is a shame considering that, for me, classic Bordeaux is all in the tannin structure. Tannins as fine as talc that can be abrasive in youth but which become rounder and fleshier with time – which is why, especially with serious Bordeaux, the buy now, drink (much) later principle should apply. That said, it rests on every wine lover to form his or her own opinion of this king of the wine of the wine world. Bordeaux, with all the terms, rules and realities which accompanies its wines, takes time to understand. There’s the politics and grandeur, the Premier Crus, the order of classifications and the rush of en primeur sales…Left Bank and Right Bank wines, all those appellations and then some. Yes, an in-depth affair with the great wine region of the world is surely not a fleeting undertaking, but it is one with great returns.